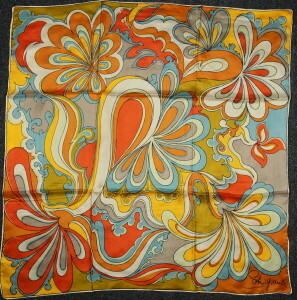 1950's vintage SCHIAPARELLI MOD large square scarf. Amber, rust, turquoise & olive silk. Rolled hem edges. Psychedelic motif print. All original 1960's vintage. Psychedelic SPLASH! Very good condition. Shows some minor wear, loose threads and slight dye run marks. Strong textile and totally wearable.